Total Annihilation brought us our first big world RTS game. Now there is a new kid on the block, Ashes of the Singularity. Does it bring back the splendor of that golden age of RTS games, or is this one doomed to the void of oblivion? 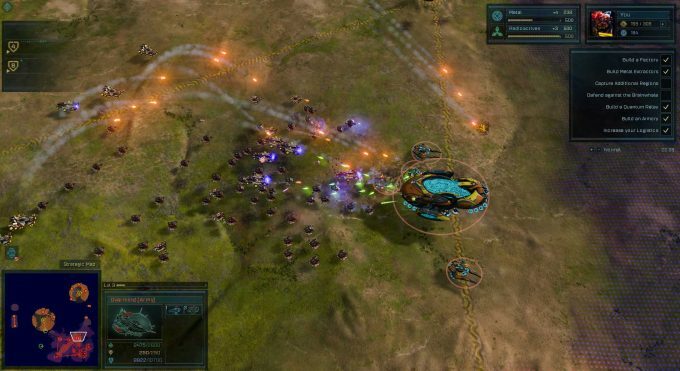 Find out in our review of Ashes of the Singularity. It is the early 22nd century where humans have taken to the stars, learned how to bend the galaxy to its will, and have achieved marvelous wonders. These feats wouldn’t be possible if they had not discovered Turinium – a unique element that has been the basis for man’s rapid expansion for the past two thousand years. At the peak of human engineered evolution, it all begins to fall apart as humanity’s existence is threatened. This new threat has proven to be a formidable foe, and in this desperate hour, they have brought you to the battlefield to handle this new threat. 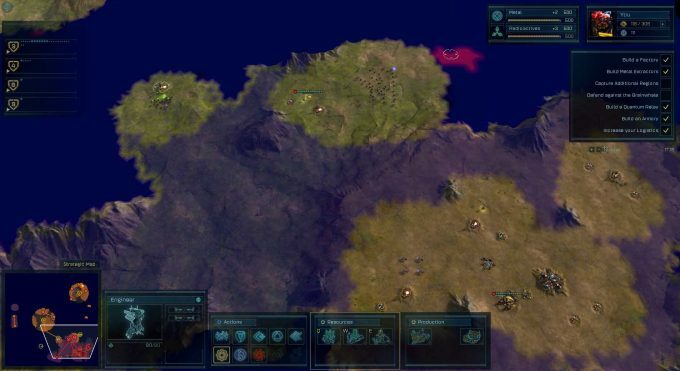 This is where the game begins your journey in Ashes of the Singularity. 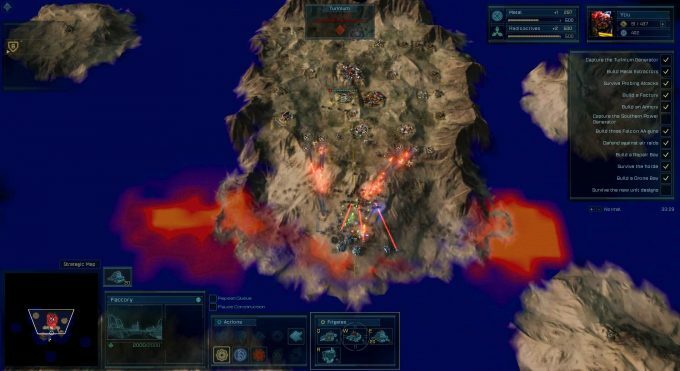 There have been many games that have tried to push the boundaries of the Total Annihilation RTS formula, Ashes of the Singularity actually feels like it has leapt beyond it’s predecessors in a very big way. This is due in no small part to DirectX 12, which has allowed the game’s engine to render up to 20,000 units on-screen at one time. As mind-boggling as that number is, the benchmark puts approximately 3,000 units on screen to stress-test your machine. I have a modestly robust system with an AMD 8350 CPU, 16GB of RAM, and a GTX 980; benchmarking this game with DirectX 11 gave me 30 FPS at 1920×1080, everything on max except MSAA, which was at 2x. I’m sure you’re thinking 30 FPS must be pretty good considering the load; with DirectX 12, I was seeing 35 FPS, and that didn’t include SLI or DirectX 12’s new multi-GPU feature, Explicit Multiadapter – or EMA. This new feature allows you to not only use similar performing cards to work in tandem, but also allow AMD and NVIDIA cards to work together. These technical accomplishments aside, there are a lot of things we need to cover. Let’s start with the AI, which I love. The reasons are twofold; First is the updated fog of war, which now has a third layer. This shows general movements of units within radar, prompting artillery and other units to start attacking the enemy if they’re outside visual range. Second, units don’t go running off to give chase to harassers, luring you with bait and ambush tactics. The game-play balance between different unit types feels like the best possible balance they could have struck with the ground units. The air units however, felt very over powered in the campaign. This could have been due to the fact that on the 4th mission, the game had just given me access to anti-air capabilities, and I only had time to build one anti-air gun before the enemy had sent 4 squadrons of bombers my way. This disparity in mission difficulty is further compounded by the fact that there is no difficulty selection what so ever. That puts new comers or casual RTS players at an obvious disadvantage in the campaign. The skirmish and multiplayer modes do provide varying difficulty with the AI, so that would be the best way to get acquainted with the game. Ashes, for all intense and purposes, feels unfinished and unpolished in many ways. There were instances where my controls would stick so I couldn’t move my cursor, or select a specific unit, requiring me to hit ESC a few dozen times to get control back. One of the major issues is a lack of voice overs in the mission campaign; in fact, the only times you hear any voice acting is the opening video when you first launch the game, and at the end of a mission. The lack of voice overs means lots of text boxes for campaign updates, which in itself was an issue. The need to keep closing box after box made me very anxious, because I knew I was against a ticking clock. There was no time given to read the text without a sense of frantically fending of an invading army. This could have been easily corrected with some voice overs and the boxes fading away after the lines were read, or pacing these missions out a little longer. This way the player could stay connected to the battle when time was against them, or rest a little to get acquainted with the story, especially in the 2nd and 4th missions. There is no option to load a game while on a mission, which can cause complications. The planet’s you’re supposed to click on at the main menu will sometimes disappear, and the only fix I found was to either restart the game, or load a save then go back to the main menu. The ability to pause or repeat a build queue appear as though they were not included in the initial HUD design either, since they appear as a few check boxes with 3D text, which is very difficult to see with the battlefield behind them. I did look at the roadmap for this game, and I feel there is a lot of hope for it in the long term. Many new features like revised HUD elements, MOD capabilities, AI personalities, Global Chat, Replays and much more will be added and updated. Unfortunately this means in the short term there will be a lot of compromising and changes, providing Stardock and Oxide Games can keep development going. The game’s audio and animations effects are superb. There wasn’t a time I saw or heard a problem with either. This means the engine is stable – stable enough to handle a war on a grand scale. As someone who’s played a lot of Supreme Commander 1 and 2, I can say I can’t wait to see what a large scale multiplayer game will bring. In the end, Ashes of the Singularity feels more like a brilliant tech demo than a game. Unfortunately there are too many features currently left out, and these need to be addressed before a final judgement. It makes it difficult to recommend this title at this point in time, but who knows later on. Thousands of units on screen. Minor and Critical UI bugs. Missions are not well planned. Can’t load a game on the battlefield. Features left out to be included later.